Ma, Z., Wu, Z., Miller, J. T. Synthesis and Testing of Supported Pt-Cu Solid Solution Nanoparticle Catalysts for Propane Dehydrogenation. J. Vis. Exp. (125), e56040, doi:10.3791/56040 (2017). Sattler, J. J., Ruiz-Martinez, J., Santillan-Jimenez, E., Weckhuysen, B. M. Catalytic dehydrogenation of light alkanes on metals and metal oxides. Chem. Rev. 114, (20), 10613-10653 (2014). Childers, D. J., et al. Modifying structure-sensitive reactions by addition of Zn to Pd. J Catal. 318, 75-84 (2014). Gallagher, J. R., et al. Structural evolution of an intermetallic Pd-Zn catalyst selective for propane dehydrogenation. Phys. Chem. Chem. Phys. 17, 28144-28153 (2015). Wu, Z., et al. Pd-In intermetallic alloy nanoparticles: highly selective ethane dehydrogenation catalysts. Catal Sci Technol. 6, (18), 6965-6976 (2016). Siddiqi, G., Sun, P., Galvita, V., Bell, A. T. Catalyst performance of novel Pt/Mg (Ga)(Al) O catalysts for alkane dehydrogenation. J Catal. 274, (2), 200-206 (2010). Passos, F. B., Aranda, D. A., Schmal, M. Characterization and catalytic activity of bimetallic Pt-In/Al 2 O 3 and Pt-Sn/Al 2 O 3 catalysts. J Catal. 178, (2), 478-488 (1998). Virnovskaia, A., Morandi, S., Rytter, E., Ghiotti, G., Olsbye, U. Characterization of Pt, Sn/Mg (Al) O catalysts for light alkane dehydrogenation by FT-IR spectroscopy and catalytic measurements. J Phys Chem C. 111, (40), 14732-14742 (2007). Jablonski, E., Castro, A., Scelza, O., De Miguel, S. Effect of Ga addition to Pt/Al 2 O 3 on the activity, selectivity and deactivation in the propane dehydrogenation. Appl Catal A. 183, (1), 189-198 (1999). Galvita, V., Siddiqi, G., Sun, P., Bell, A. T. Ethane dehydrogenation on Pt/Mg (Al) O and PtSn/Mg (Al) O catalysts. J Catal. 271, (2), 209-219 (2010). Shen, J., Hill, J. M., Watwe, R. M., Spiewak, B. E., Dumesic, J. A. Microcalorimetric, infrared spectroscopic, and DFT studies of ethylene adsorption on Pt/SiO2 and Pt-Sn/SiO2 catalysts. J Phys Chem B. 103, (19), 3923-3934 (1999). Silvestre-Albero, J., et al. Microcalorimetric, reaction kinetics and DFT studies of Pt–Zn/X-zeolite for isobutane dehydrogenation. Catal Lett. 74, (1-2), 17-25 (2001). Sun, P., Siddiqi, G., Vining, W. C., Chi, M., Bell, A. T. Novel Pt/Mg (In)(Al) O catalysts for ethane and propane dehydrogenation. J Catal. 282, (1), 165-174 (2011). Sun, P., Siddiqi, G., Chi, M., Bell, A. T. Synthesis and characterization of a new catalyst Pt/Mg (Ga)(Al) O for alkane dehydrogenation. J Catal. 274, (2), 192-199 (2010). Okamoto, H. Phase diagrams for binary alloys. Desk handbook. ASM International. Member/Customer Service Center. Materials Park, OH 44073-0002, USA. (2000). Hamid, S. B. D. -A., Lambert, D., Derouane, E. G. Dehydroisomerisation of n-butane over (Pt, Cu)/H-TON catalysts. Catal Today. 63, (2), 237-247 (2000). Veldurthi, S., Shin, C. -H., Joo, O. -S., Jung, K. -D. Promotional effects of Cu on Pt/Al 2 O 3 and Pd/Al 2 O 3 catalysts during n-butane dehydrogenation. Catal Today. 185, (1), 88-93 (2012). Han, Z., et al. Propane dehydrogenation over Pt-Cu bimetallic catalysts: the nature of coke deposition and the role of copper. Nanoscale. 6, (17), 10000-10008 (2014). Komatsu, T., Tamura, A. Pt 3 Co and PtCu intermetallic compounds: promising catalysts for preferential oxidation of CO in excess hydrogen. J Catal. 258, (2), 306-314 (2008). Gallagher, J. R., et al. In situ diffraction of highly dispersed supported platinum nanoparticles. Catal Sci Technol. 4, (9), 3053-3063 (2014). 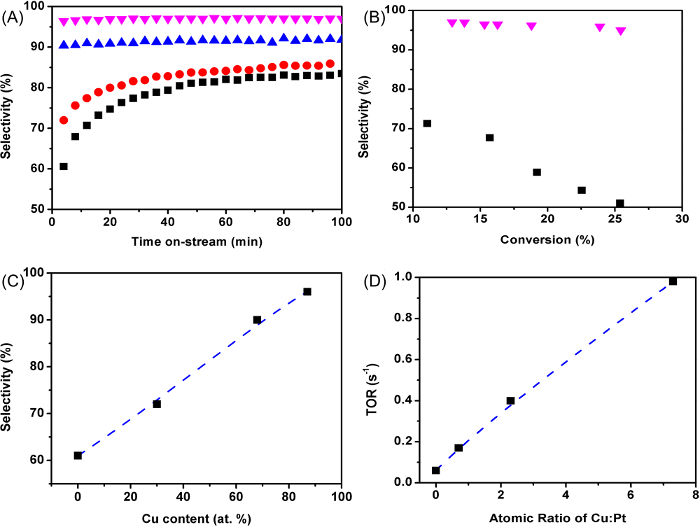 Ma, Z., Wu, Z., Miller, J. T. Effect of Cu content on the bimetallic Pt-Cu catalysts for propane dehydrogenation. Catal Struct React. 3, (1-2), 43-53 (2017). Richards, R. Surface and nanomolecular catalysis. CRC Press. (2006). 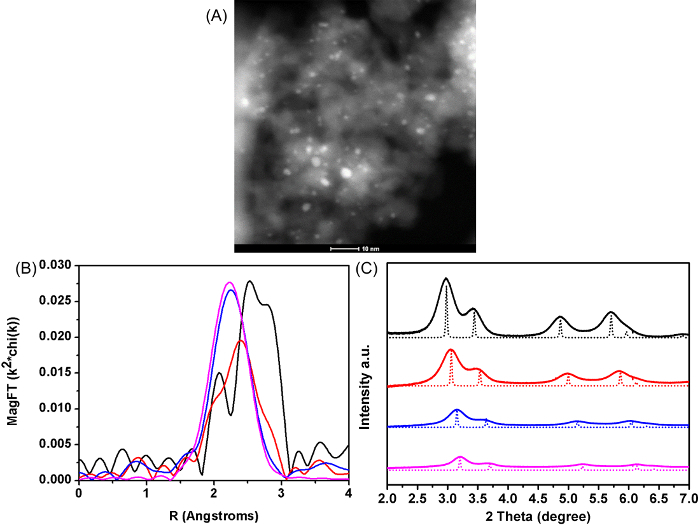 Jiao, L., Regalbuto, J. R. The synthesis of highly dispersed noble and base metals on silica via strong electrostatic adsorption: I. Amorphous silica. J Catal. 260, (2), 329-341 (2008). Miller, J. T., Schreier, M., Kropf, A. J., Regalbuto, J. R. A fundamental study of platinum tetraammine impregnation of silica: 2. The effect of method of preparation, loading, and calcination temperature on (reduced) particle size. J Catal. 225, (1), 203-212 (2004). Wei, H., et al. Selective hydrogenation of acrolein on supported silver catalysts: A kinetics study of particle size effects. J Catal. 298, 18-26 (2013). Ertl, G., Knözinger, H., Schüth, F., Weitkamp, J. Handbook of heterogeneous catalysis: 8 volumes. Wiley-vch. (2008).